Reviews for the Little Prince are in! "a feast for the eyes and the imagination that stays with you long after you have left the theater." 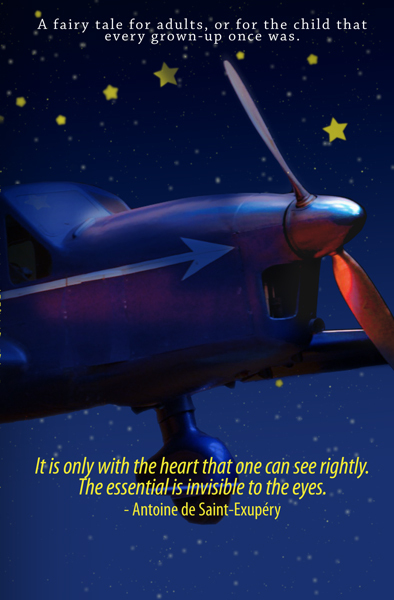 The Little Prince … isn't your typical children's show. …philosophical and melancholy with good acting, artistic aspirations and an international crew. The play is very well acted. Accomplished eleven year-old actor Ian Pederson had previously played the son of Phedre with Helen Mirren as Phedre at the National Theatre of London. Alex Vernon did a fine job as the pilot and Sarah Olmsted Thomas and Ilana Naidamast were convincing as the fox and snake respectively. The very effective set was just made up of draped white fabric. The costumes were clever, the masks and shadow puppets by Bulgarian artists were terrific, and the original music by Georg Silver from the Canary Islands was beautiful and evocative. My daughters and I liked the show very much. Younger children in the audience enjoyed the show as well and there was no squirming or chatter. "Magic is created…" "Highly recommended production"
Ian Pedersen is honored to b perform at The Ambassador Theatre and would like to thank Hanna for giving him this wonderful opportunity. Previous theatre roles include National Theatre of London production of Phedre with Helen Mirren as Phedre’s son; Shakespeare Theatre Company, Imaginary Invalid, Boy; Synetic Family Theatre, Nutcracker, Peter; Reston Community Players, The Full Monty, Nathan. Spongi Toy Commercial. Ian would like to thank Lilia Slavova, the director and acting coach, for her on going support and love. Sarah Olmsted Thomas most recently completed training with the Pig Iron Theatre Company in Philadelphia and performed in their mask and clown Soirée. Before that, she appeared with the Private Ear Audio Theatre in New York for their season finale at the Brooklyn Lyceum (Gertrude/Suzy). She has performed with Synetic Family Theater in The Snow Queen (Granny, Robber Leader), Ambassador Theater in Hopa Tropa! (Boriana), and Factory 449 in 4.48 Psychosis (Body Image). Sarah studied clowning and mime in Paris with Le Samovar theatre and Racine and Sarah Kane with Philippe Dormoy (César d’Honneur) of La Compagnie Nomad. B.A., Sarah Lawrence College. Ilana Naidamast has been performing since she was 6-years-old and has appeared in several of her high schools productions. This is Ilana’s first appearance in a professional theatrical showcase. Ilana is ecstatic to be working with the Ambassador Theater and is deeply greatful to Ms. Hanna Bondarewska and Ms. Lilia Slavova for this amazing opportunity. She also wishes to thank Sarah, Ian, and Alex for making every rehearsal a new and exciting experience and particularly thanks her parents for always believing in her and helping her to realize her dream of becoming a professional actress. Most of all, Ilana wants to thank everyone for coming to the show and hopes they all enjoy the performance! Lilia Slavova, (Director, an Audience Choice Award winner for directing “The Snow Queen” at the Synetic Theater, receipient of the St. Cyril and St. Methodius Award for the artistic achievements in promoting the Bulgarian culture) has received her MFA Degree in Dramatic arts from renowned Higher Institute of Dramatic arts in Sofia, Bulgaria. She has over 30 years of acting, directing, choreographing and teaching in Europe and United states. She has been directing puppet shows for the last 12 years with Classika, now Synetic theatre and she has also been Director of the studio and Director of education. Among many of her successful shows she has directed are: The Nutcracker, Wondrous White Winter, Three Little Pigs and Little Red Riding hood, The Story of a lost sock and others. Member of all the unions she has been acting but mostly enjoying what she loves the MOST-Teaching. Well recognized acting coach and talent scout Mrs. Slavova is happy to see her students on the screen, Broadway and theaters through the Washington Metro area. Georg Silver (Composer) is a well renowned musician ,composer and song writer who have traveled through Europe, Asia and Africa with his band The Silvers for the last 20 years. His first USA project was original music for Synetic Theatre summer camp for the show Nabbed. He dedicates this works to his Rose! Gus Soudah (Lights) is a lighting designer of 15 years. His work has ranged from films, television and music videos. He has won 3 emmys and received an emmy nomination for lighting in 2001.This marks his second time working with the Embassador theatre and Gus looks forward to future productions with the group. Julia Tasheva, (Master Puppeteer, Puppet Designer) holds a master’s degree in puppetry from the National Academy of Film and Theater Art in Sofia, Bulgaria. She is an award-winning puppeteer, having won best actress in the Bulgarian National Puppetry Awards for her role as Pinocchio. Ms, Tasheva is also an accomplished mime, having toured Europe with the “Theatre for New Forms” and “Balagan Mime Theatre”. She is also an award-winning visual artist. Julia has extensive experience with a wide variety of puppet systems as well as acting, pantomime, teaching ,coaching and designing throughout the Washington metro area. We’ve seen her in many puppet shows at Classika/Synetic Theatre. She has designed puppets and sets for “Kashtanka” and “Beauty and the Beast” at Northern Virginia Community College and for“Alice in Wonderland,” “Matsukaze,” “The Snow Child”, “The Story of the Lost Sock”, “The Penguin Story” and “ Mother Goose” at Classika Theater, and for “Hopa Tropa” at Ambassador Theater. Vanya Vasileva (Masks) Vanya Vasileva (Mask Designer) is a visual artist that creates work in many different genres. She received her MA in Graphic Art from the National Academy of Fine Arts in Sofia, Bulgaria in 2000. She has extensively exhibited both her painting and mix-media work in her native Bulgaria and abroad. She has worked as a stage designer and decorator for the Puppet Theater of Varna (Bulgaria). In 2009 Vanya was the organizer and lead painter for Rainbow of Stars, an international children’s festival and competition. Chelsea G. Mays,Stage Manager is a recent graduate of Bowie State University with a B.S. in Theatre. She has starred in many theatrical works such as Pearl Cleage’s Flyn’ West and William Shakespeare As You Like It, to name a few. Chelsea has also directed The Phone Art by L.B. Stuart and The Chain by Pearl Cleage. During Capital Fringe Festival she assistant directed The Nina Variations by Steven Dietz and does children’s theater workshops regularly. Chelsea would like to thank her Mother for her support. A gallery of images from our first rehearsals of The Little Prince. Today is 12th of August 2010. I am waiting for my very special night-the night when my wishes will come true! This very night there will be a meteor shower when between 70 and 100 stars will fall from the sky every hour. In many cultures, the stars conjure up various myths. In some of them if you see a falling star it means that you can make a wish, or there will be a war, the emperor will die. For me this night is the moment of finishing my director’s book on The Little Prince. I made my wish- I want all of you who read The Little Prince years ago to come and see it new, with the eyes of a little boy. For those of you who read it when you were young and did not understand all of it, maybe now you will learn something new. For those who only have heard about it, enjoy it, for those who want your kids or your grand kids to see it with you watch it together, have a family discussion. For those of you who had their rose and left it behind remember those precious moments. The little prince is everyone’s story! You may have not known that The Little Prince is also your story. It is only with the heart that one can see rightly. The essential is invisible to the eyes. Even though The Little Prince, one of the greatest novels of all time, has always been one of my favorite books, I don’t think I ever truly understood the meaning behind of the secret of the fox-until tonight, the night of the shooting stars! I wish for you during this play to see not only with your eyes, but also with your heart. To experience long-lasting and exciting adventures with our characters, to recognize and show love to those who mean a lot to you. I wish you not just to look at the play, but to see it, so that you can truly enjoy every moment. Enjoy the journey of our little prince and the characters he meets in his travels from planet to planet. I choose to produce this play for a few reasons- the first is my student Ian Pedersen who has been with me since he was 5 years old and grew in front of my eyes. Sweet, polite and innocent Ian has a lot of the qualities of the little prince. I love the effect of shadow puppets on the stage. There is something magical about them. There is also no limit, as the subject of the story. Working with a fabulous team of puppet makers and puppeteers makes this experience even more magical. Working on the music with Georg Silver and his band was a magnificent journey, mimicking the play itself in sorrow, happiness, struggle and beauty. I dedicate this play to all my friends who were once 6 years old!